DSC Sport Module Worth it for your Focus RS? 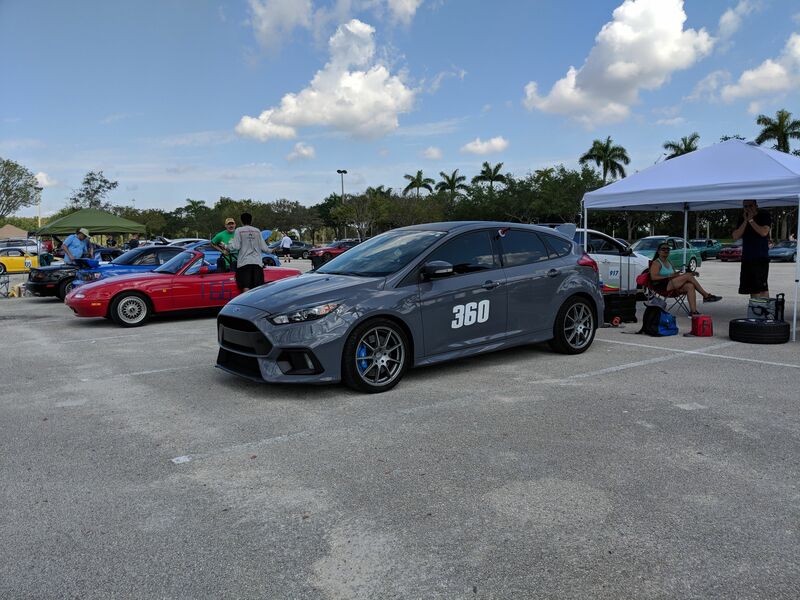 I finally had the chance to take and test the DSC Sport Module for my 2016 Focus RS at my local autocross. I wanted to see what kind of benefits the DSC Sport Module have for the stock dampers for the Focus RS to make it more active damping based on the car’s ECU inputs for G-force, braking, etc. I used a similar technique that I heard on a car podcast with some auto journalists sharing how they test performance parts and changes on cars. I did a on/off replacement of the stock control module and swapped with the DSC Module every other run, starting with the stock module. The autocross group I run with, ERSCC, allowed us to drive six runs for that day’s session. The placement of the control module in the Focus RS isn’t in a bad spot to remove and replace. It takes a matter of seconds for me to swap parts due to the fact I already have my interior bits unscrewed and just need to pry apart and snap it back together in the hatch area. The course was a pretty fast one, integrated with two 180 turns, and two slaloms(one short 3 cone, and a longer 6 cone pass). The average time was between 40-41 seconds between all the drivers that day. The parking lot we ran on is known to all the local autcross clubs to have dips, expansion cracks, inclines, declines, sandy debris, and pebbles all over. It makes these courses interesting to see how one deals with weight transfer through all the corner transitions, which I think is great for testing out the DSC control module on my Focus RS. Anyways, on to the good stuff, the data. The data isn’t very conclusive, but again, shows some sort of consistency. Comparing the delta of the first two runs with the stock module vs the DSC module show a half second of difference between the two. Continuing the trend, comparing the second set of times show an improvement of at least 1.5 seconds but a little bit more for the DSC. That last delta for the DSC module, I believe shows more my driving adjustments to the course and also going “balls out” for the last run rather than any changes to the module. I honestly didn’t notice too much of a difference in my inputs of the suspension, as I was concentrating more on getting a more smooth run to make up time in the slaloms and try to beat some of the fastest and more experienced drivers in the club. So, in conclusion, I have no conclusive evidence, except I need to learn how to drive in autocross courses better. haha. But really, I think for the limitations of the stock dampers for variance in change is what is really holding back this module to becoming a huge improvement for performance applications, but for daily driving use, I believe in my experience has shown much improvement. I have just spent 1800 miles on this controller over the past week since I received it and installed it. I’ve driven through various terrains from well paved highways to unpaved twisty mountain roads to cobble stone streets. I was skeptical at first when I plugged it in. Initially, I was expecting to get some placebo/fake validation on the $1200 I spent on a plastic box in the trunk. I drove on the road with the bumps. It felt exactly the same. I drove in the neighborhood with speed humps. It felt no different. but about 30 min later, I was driving back home and reached a low speed right hand turn that has a road sign suggested to take at 20mph, where I took it a bit faster normally everyday. It was right then where I felt the difference. It was this low speed turn where I noticed the planted-ness of the car (not a real word, I know). This makes me think that the statement of the oil in the dampers needed to “warm up” holds true. Any pogo feeling or skipping that I think some owners have experienced seem to be gone. Although the suspension felt good and I was feeling a bit better on selling some early crypto gains to get this electronic suspension tuning box, I wasn’t 100% convinced. I figured I’d notice more with more miles. The rest of the 1800 miles I’ve spent included a road trip from S. Florida to North Carolina with majority of it on normal mode. I’ve driven in the streets of the oldest city in the U.S. where you wouldn’t expect the most wonderful streets. The cobble stone was still rough but better than I would have expected, but I really can’t say DSC did it’s job since I was going about 15mph. Rough highways with uneven pavement was as expected. I finally got some more fun with on/off ramps because S. FL is devoid of any fun cloverleaf interchanges. I enjoyed these much more and felt more confident at higher speeds than the on small ones I get to drive at 60mph max. Paved and unpaved mountain roads of North Carolina were fun. Transitions from left to right on curves, switchbacks felt great with much grip. The unpaved roads of the Cataloochee valley on normal mode seemed fine. I truly can not imagine how it would have been with out the active damping. I’m one of those folks who didn’t complain about the ride quality for DDing, but I later noticed I’ve been blessed with commutes with very decent roads. I’ve taken the RS on a road trip before and managed to wake my wife up on the rough parts of the highway or construction. This time, she slept through continuously through similar conditions until I had to brake more suddenly when we reached traffic and even then she apologized thinking she woke up from her snoring. Although it is agreed that the stock sport suspension is unusable in most conditions, I like it as a gimmick laugh mode and was scared I would loose that with the DSC installed. I have switched back and forth to see if I would get that sensation and noticed on some roads it was no longer the silly party trick and was more improved when at higher speeds >50mph. Although, I was driving on SR 202 East to Jacksonville Beach and noticed the rough bumpy road in normal mode and decided to see if sport suspension would bring back that laughable suspension feeling back, it did. I guess on some roads, the stock dampers and DSC just can’t handle it, not that Sport would have been the mode of choice for the road anyhow. Thinking back to one of my original road trips, I did feel a bit that the stock suspension felt over damped but was able to brush it off despite the complaints from the wife. This time I didn’t notice it as much while driving on some bumpy highways. I can’t wait to get this on autocross. Unfortunately this might make my car faster, but not make me a better driver. I’m thinking that this controller will punish me much less for bad braking, racing lines and upsetting the car’s balance around corners. It feels like there will be more grip for me in the future. After owning the RS and over damping my adjustable Konis in previous cars, I don’t think I could get another sports car without active dampers. I really like knowing that these dampers can still be tuned. I can’t imagine what this controller can do when tuned to the Tractive dampers with better tolerances (or any aftermarket adaptive dampers) vs the stock Tenneco ones. I’m comparing my stock suspension experience with 2 track days, and a full season of Autocross on bumpy parking lots that corvettes fear. I was skeptical at first with the DSC controller and after 1800 miles later on various roads, I’m very happy with it and think it’s a great first suspension mod for those lazy/inept/with fat wallets to do on their stock RS to improve ride quality and more grip on less than ideal road surfaces. So I took some crypto gains to purchase this little box to install on my Focus RS before a road trip. As most owners and those who followed the release of the Focus RS, that the suspension and ride is less than cushy comfort for daily driving for some. I found it ok. It was definitely feeling like a stiff sport suspension, but daily driving around 21,000 miles, I didn’t feel the need to whine and complain about it. Anyways, I purchased it more making my semi-active suspension (on the fly damper adjustments for normal and sport) to a fully dynamic active system as well as for my passengers who don’t seem to appreciate the spine tickling suspension on less than perfect roads. DSC Sport offers a plug-and-play factory replacement controller that provides CAN-integrated Dynamic Suspension Control with unlimited tuning capability. Gathering CAN data from the vehicle in real time, DSC Sport sends a signal to each individual corner to control the damping level based on g-force, vehicle speed, brake/throttle input, and more (specific inputs vary by vehicle and package). The result is an active suspension setup that provides more grip to the tire, greater stability and ride control, and increased comfort for all driving styles and road conditions. These guys make applications for most cars that feature an electronic suspension from the Nissan GTR to the Porsche 911s and Camaros. They also provide support and software to fine tune your suspension data to better fit your driving needs. This is the future of suspension tuning. Although some might say that this modification might not provide faster times on the track or autocross, I’m led to believe that the driving feel will be much improved once I find out for myself. I’m sure it will remove the pogo-ing feel that the over rebounded dampers in sport mode provide and keep my tires connected to the pavement, just like most owners notice with minor changes to springs, sways, and wheel and tires. So, installing this before a long road trip from FL to NC should give me a good idea if I cashed out on some of my hodlings well. Any improvements over that will just be icing on the cake.